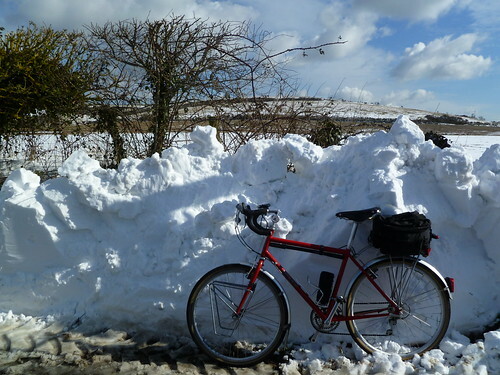 There are only 2 things guaranteed to keep me from cycling – illness and snow. Unfortunately in the last week I've managed to have both! I was away for a month, then had a stomach bug, so I'm just beginning to get back into cycling again. This being March, I wasn't unduly worried when the forecast for Monday was for light snow. Generally this just means that a few little flakes drift down occasionally and cycling continues as normal. This time, however, they were accompanied by a biting North East gale, and although the flakes were small they just kept falling and falling. I abandoned the idea of cycling and went for a walk on the Downs instead where the howling wind reminded me of an old film of 'Scott of the Antarctic' that I'd seen recently! By evening the roads were treacherous and the snow was still falling – it looked like there would be no cycling on Tuesday either. By Tuesday afternoon the sun was beating down and the snow on my road had melted so I thought I'd venture out. I set off on my favourite route, blithely ignoring the 'Road Closed' sign. I was enjoying the lack of traffic when a van came the other way and flagged me down. "You'll not get through there" he said, "They're clearing the snow with a digger". I turned round and tried the main road but piles of snow spilled onto the edge of the road and there was a lot of traffic. In a rare victory for common sense I returned home and went for another walk. On Wednesday morning most of the snow had melted, the sun was shining and I tried again. It didn't take long to realise why the road had been closed the day before. So that's why the road was closed! Most of the road had no snow left at all but it had clearly been covered by a huge drift, most of which now sat in dirty brown piles on the other side of the road. I saw no more significant snow until I neared the top of Blackgang, the island's highest road. I had expected the snow there to be impressive and I was not disappointed, there were some magnificent sculpted cornices which made the road seem more like the Alps than the balmy south coast! 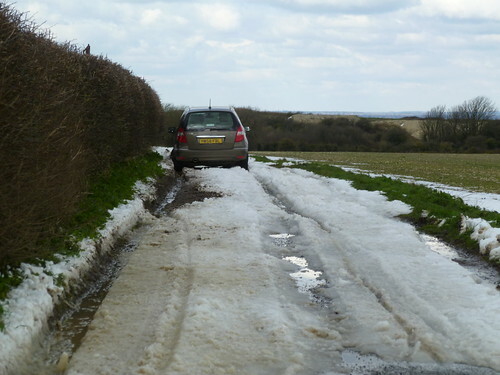 Once over the other side there were just small patches of snow until suddenly another drift appeared spilling across one side of the carriageway and reducing the road to a single lane of deep slush. I was pedalling carefully through it when a line of cars appeared in the opposite direction, forcing me to retreat into the hedge. They did give me a cheery wave as they sprayed me with slush! The further I went the less snow there was and as I turned towards the north side of the island I thought it had gone for good so I decided to risk a small lane that is always a bit rough and muddy. Rounding a bend I spotted a car that had obviously had the same idea. However, unlike cyclists, car drivers can't just get off and walk when they hit unexpected snow. They were well and truly stuck. I was thoroughly enjoying forcing my way through but the elderly couple in the car were far from happy. He was making frantic phone calls and they both seemed quite panic stricken. I asked if there was anything I could do to help but I didn't really think I could tow them out with my bike! They suggested, rather more sensibly, that perhaps I could ask a farmer if he could tow them out with a tractor. I was thoroughly enjoying my Good Samaritan act as I ploughed back through the snow and into a nearby farmyard. I soon located the farmer who said he would be out to them in a few minutes – he had already towed 5 cars from that same spot! I went back to tell the couple the good news, glorying in the superiority of bikes over cars. They were mighty relieved and thanked me profusely. We cyclists have our uses! The northern side of the island was completely snow free but I'd had great fun on the snowy southern side. Posted by Hilary on March 14th, 2013. 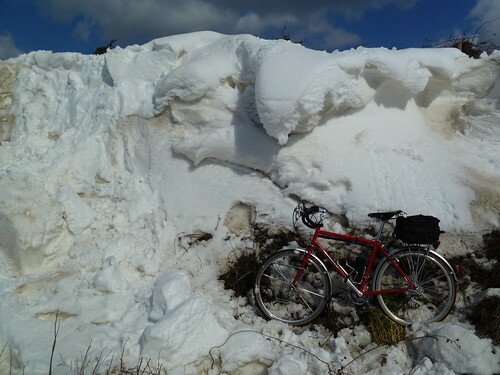 Brave work, riding through those snow drifts. The snow cover always looks dirty at this time – the winter's dirt and debris surfaces and everything looks gritty. Nor is it good for riding. I doubt they use any salt on IOW or you would not have subjected Why?Bike's tender components to the road spray. Good rescue, by the way. The impressive cornice looks like gigantic scoops of ice cream. We've had weather almost as bad as that. But thankfully it has largely disappeared before I've had the urge to cycle through it. Hilary wrote: ...went for a walk on the Downs instead. I can relate to that, having walked more this winter than cycled, although February wasn't too bad for cycling. It's just about a year ago when me and Chris went cycling in the Yorkshire Wolds in well over 20 degrees. Good photos – I like 'March snow 003' especially. Thanks Kern. More records broken probably. The ****est **** since records began. No cycling for me just now. Not even walking. Wonderful post Hilary, loved your pics and I agree with Chris, with the icecream look pic. Our island got it first real blast of winter yesterday, and everyone had a duvet day! 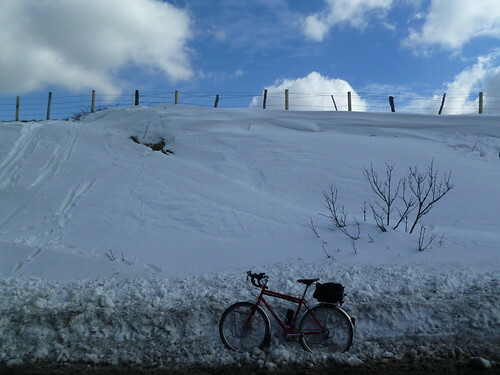 Hard to believe that last Easter in March, I was cycling up to Dent in 20 degrees C.